Read about Blessy and Steve's beautiful Punta Cana destination wedding. Blessy and Steve met through online dating over 14 years ago, before it was a part of the mainstream and a common way couples meet like today. Originally, they were hesitant about meeting someone they had just met online, but once they did, they hit it off immediately. Blessy said, “We both thought, this person can’t be real!” Blessy and her son took Steve into her family quickly, and 2 years later he proposed. The couple had decided on a stateside wedding initially, one elaborate and lavish, but in the middle of planning Blessy found out she was expecting, and the couple decided to elope instead. Steve promised Blessy they would have a big wedding for their 10th anniversary, and after the couple celebrated it they chose a destination wedding to renew their vows. They first looked into Puerto Rico and the Virgin Islands, but after the devastation of Hurricane Maria, there wasn’t much available in their specific time range. With the newfound help of Destify and their agent Brittany they found the Majestic Elegance resort, in Punta Cana. The wedding department proved to go above and beyond, especially once they got to the resort. Once in the Dominican Republic a couple of hiccups happened at the resort, which Majestic handled with grace. Two days before their wedding they were notified that their wedding venue had to change due to the number of guests another wedding group had. As an apology, Majestic offered to upgrade their semi-private dinner reception to a private one, booking the couple for one of their beautiful chandelier-clad ballrooms. They held their wedding ceremony in the garden gazebo, surrounded by the lush vegetation and colonial columns. 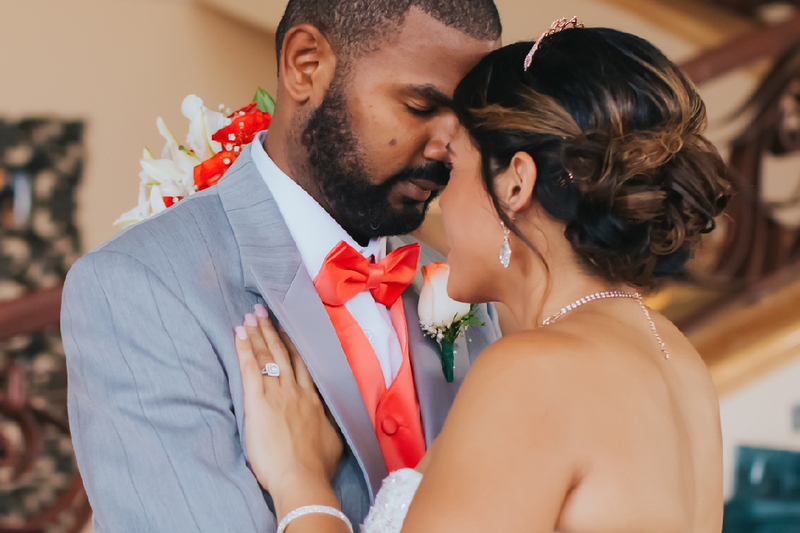 Blessy said, “Sun and palm trees were the perfect background for our ceremony!” Since their reception was now in a private area they were even able to contract a DJ last minute, and everyone danced the night away. The couple agreed that Majestic proved to be the perfect resort. Blessy’s advice is to be as honest with your wedding coordinator as you can, and then let them do their thing. They have everything under control. Even with last minute changes I wouldn’t change a thing! We all cannot wait to go back to Majestic.